In the past couple of years, I’ve had to do a lot of waiting. Waiting for our house to sell. Waiting to purchase a house. Waiting for my husband to get out of surgery. Waiting for a ministry to launch. Waiting for the call of God on my life to be fulfilled. Waiting for a job for my husband. It’s not easy to wait especially when circumstances are completely out of our control. God has been teaching me a lot in this waiting season. He has great things in store for those who wait on Him. Why does God have us wait? To develop patience and peace in us. To define or refine our purpose. To reveal His pleasing and perfect will. To strengthen our prayer lives. To allow for His provision. To remove pride in us. We can either become impatient and take things into our own hands (which I seem to often be asking forgiveness for) or we can wait with hope and expectancy that God has a better plan and He can fully be trusted. God gets the most glory when we wait well. How do I wait well? I have personally experienced the worth of waiting well! God’s ways are so much higher, so much greater, and so much more perfect than my ways. Will you join me today in choosing today to wait well? God, how we praise you for knowing so well what is best for us. You are worth the wait. Forgive us for our impatience, unbelief and lack of trust. Thank you for teaching us about ourselves and about You in the waiting seasons of our lives. We ask You to use our waiting seasons to bring you much glory! In the comments below, please share your story of waiting well (or not waiting so well). What have you learned in your waiting season? How is God getting glory as you wait on Him? Stay connected and get MORE. Subscribe to our newsletter to receive encouragement, inspiration, and support along with the latest news, updates from our team, and invitations to MORE events. We're glad you want to experience MORE! 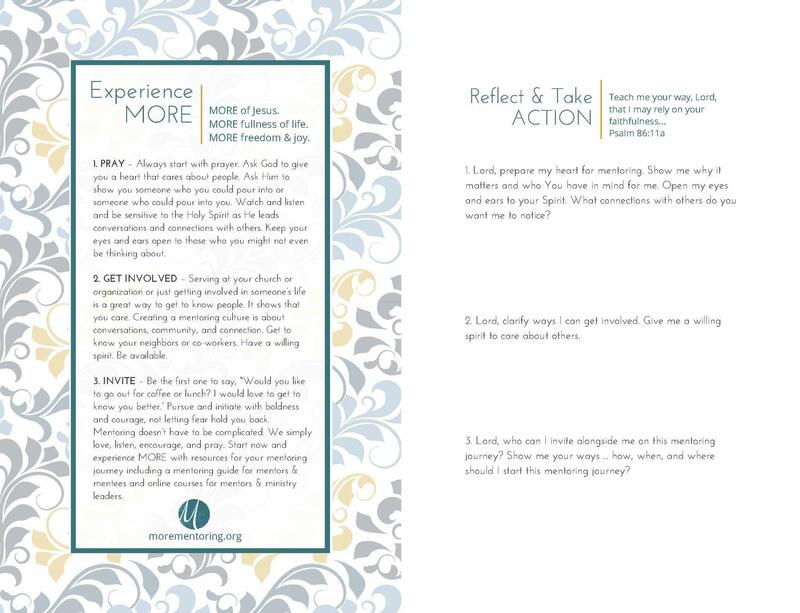 Let us send you this beautiful guide, "3 Action Steps," as you begin your mentoring journey. YES, SEND ME "3 ACTION STEPS"